Home / News / Discover Mysterious Metéora in the Skies! The place is not large in size but it has an amazing atmosphere especially in gloomy weather. You can visit and admire 6 monasteries and enjoy the surrounding countryside. In this guide you will find 32 photos incl. GPS and travel and photo tips from the author of the guide Brendan van Son, Canadian travel photographer and journalist. Did you know that James Bond story “For your eyes only” was filmed in Metéora? Beautiful scenes were filmed in Agia Triada Monastery (The Holy Trinity). Brendan is a travel photographer and journalist from a small town in Canada called Rocky Mountain House. After completing degrees in Political Science and Geography in 2008 he headed to South America to take a job that paid him only $50 a week, but allowed him to travel. He knew within 3 days of arriving in South America that he’d never stop traveling, that he needed to find a way to meld travel into his career, no matter what it took. Over 5 years later now, he’s visited around 80 countries on 6 different continents. He’s done some crazy things like drive a $600 scooter down the west side of Africa. He’s done some amazing things, as well. He counts his blessings that he is able to live this lifestyle. In the 5 years since he’s engaged in the life of a travel photographer and journalist his work has been in a number of major publications such as The Guardian. His travels themselves have also been featured in various major media outlets such as the BBC, National Geographic Traveler, and others. He has no intention of slowing down. So if you like traveling and photos, follow his blog http://www.brendansadventures.com. 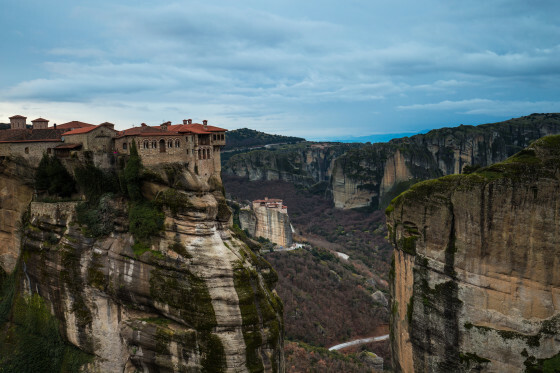 This entry was posted in News and tagged Brendan van Son, cliffs, Greece, Metéora, monasteries, rocks, sandstone. Bookmark the permalink. Explore amazing nature of New Zealand in 3 weeks! Explore Florence iconic Tuscan gem & charming Cinque Terre!